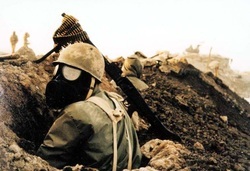 The Iran Iraq War included a Shiite Revolution that had taken place in Iran. The Shah was then replaced by Ayatollah Khomeini which definitely concerned Saddam Hussein. Khomeini supported Iraq because they were very anti-American. The United Nations were then involed in 1988 which is when a formal treaty was signed in 1990.